Founded in 1969 for the UK wine trade, WSET is a London based awarding body and registered charity devoted to the development and delivery of qualifications and courses in wines and spirits. WSET certificates are recognized worldwide in this trade and help wine enthusiasts mature their knowledge and skill in handling the wine industry. This qualification will provide a basic introduction to the main styles of wines to the interested candidates. This qualification aims to provide the basic product knowledge & skills in the storage & service of wines. The principles of food & wine pairing. This is a minimum 6 hours course which will be conducted by WSET Approved Program Provider. An assessment consisting of 30 multiple choice questions will be given to test your knowledge & understanding about wines. It will be a closed book examination & the exam duration is of 50 minutes. You will need to answer at least 30 questions correctly to pass & obtain The WSET Level 1 Award in Wines. Upon successful completion you will receive a WSET certificate & lapel pin, & will be able to use the associated WSET certified logo. This qualification explores the major grape varieties & important wine regions in which they grow and will specially interest those individuals seeking a core understanding of wines. Key classifications & labeling terminology associated with specific grape varietals & style of wine will also be provided. The production of sparkling, sweet & fortified wines. The principal categories of spirits & liqueurs & how they are made. 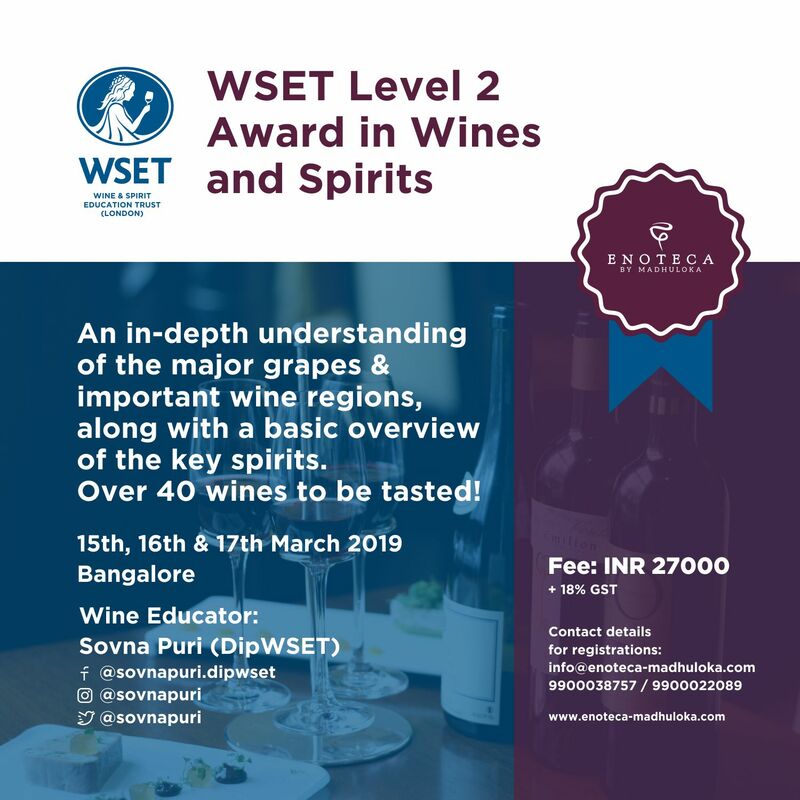 This qualification has a minimum requirement of 28 hours of study time, including 16 hours of the session which will be conducted by WSET Approved Program Provider. An assessment consisting of 50 multiple choice questions will be given to test your knowledge & understanding about wines. It will be a closed book examination & the exam duration is of 50 minutes. You will need to answer at least 31 questions correctly to pass & obtain The WSET Level 2 Award in Wines. Upon successful completion, you will receive a WSET certificate & lapel pin, & will be able to use the associated WSET certified logo. Sovna Puri is a Wine and Spirit consultant with 13 years of experience in India, UK, and France. She has completed the Level 4 Diploma in Wines & Spirits from WSET, London (a globally recognized wine and spirits qualification) which makes her one among 10 people in India with this qualification. She is also one of the 4 WSET Certified Educators in India. Enoteca by Madhuloka is committed to maintaining the confidentiality of the personal information collected on this form and undertakes not to reveal the applicant’s information to any 3rd party without prior consent of the applicant. Full Payment must accompany the booking form as we do not accept provisional bookings and places will only be confirmed once payment is received. Bookings will only be accepted on valid booking forms with a fully completed and signed declaration. Full Payment of the course will be due 14 days prior to the start of the course. Withdrawal application/notice from the course must be sent to Enoteca by Madhuloka at least 2 weeks before course commencement. Course fees will be refunded in full if Enoteca by Madhuloka changes a course date or cancels a course. Notification will be made no less than 10 working days prior to the planned start date of the course. Transfers of a confirmed booking either to another identical course or applicant can be made if notification is received in writing up to 14 working days before the course start date on payment of INR 2000 administration fee per student. Within 12 working days prior to the start of the course, no refund or transfer of the course fees will be made. All transfers are subject to the availability of alternative course/examination dates. Once the payment has been received and the place confirmed by Enoteca by Madhuloka, the study pack will be sent to the student ́s address indicated in the booking form. WEAT and WSET Level 1 course materials are provided to students on the first day of the course. They will not be posted in advance. WSET Level 2 course materials will be posted to a student’s home address on confirmation of payment of fees. At Enoteca by Madhuloka, we strive to create an inclusive environment for all of our students and will make any reasonable attempt to provide support if you have any additional access or educational needs as a result of a disability. Requirements will be evaluated on an individual case basis. Enoteca by Madhuloka has the right to cancel or postpone a course either in case the minimum number of students is not reached or for logistics reasons. In these cases, the new dates will be communicated by email to students. Candidates above the legal age of drinking will only be allowed to taste the wines.